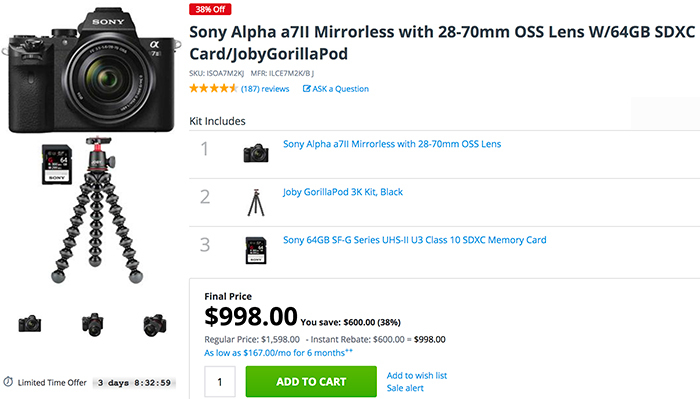 Sony A7II with 28-70mm FE and ton of free extras for $998 at Adorama, Amazon, BHphoto, FocusCamera and BuyDig. Sony A6000 with two E-mount lenses and free extras for $598 at FocusCamera, Amazon, Adorama, BuyDig and Bhphoto. 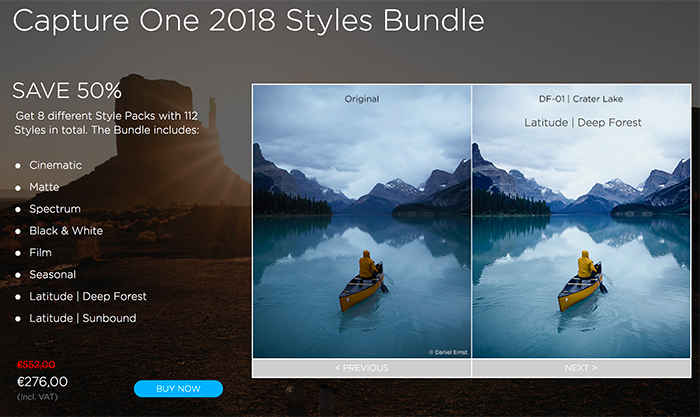 You save 50% + additional 10% with our coupon code “AMBMR” on the Capture One 2018 Styles Bundle (Click here). It includes 8 styles packs with a total of 112 styles. Today Skylum launched the new Luminar 2018 with Sky enhancer tool. For a limited time you get this package with a $10 discount using our code “MIRROR” and extra Bonuses (see list below). And in December you will get the Libary tool for free too.
? New users can purchase Luminar 2018 for US$59 ( US$49 with your coupon code).
? Current users of Luminar 2018 will be able to update for free .
? Current users of Luminar 2017 can upgrade for US$49 ( US$39 with your coupon code).
? Current users of a Luminar 2018 trial (those who have downloaded it before November 1) can purchase Luminar 2018 for US$49 ( US$39 with your coupon code).
? Owners of Skylum legacy products (Creative Kit, Noiseless, Intensify, Tonality, FX Photo Studio, Focus, Snapheal, Filters for Photos) can purchase Luminar for US$49 ( US$39 with your coupon code).
? Current users of Aurora HDR (2016–2019) can purchase Luminar for US$49 ( US$39 with your coupon code).
? 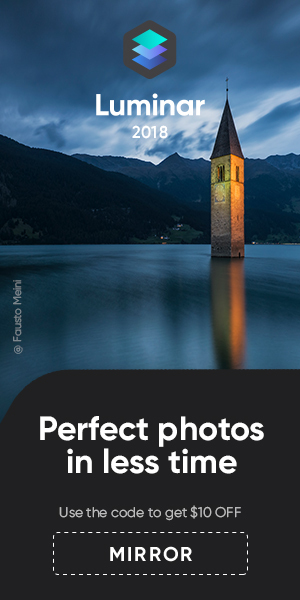 Current users of Photolemur can purchase Luminar for US$49 ( US$39 with your coupon code). Skylum has released a free update to Luminar that brings AI Sky Enhancer, designed to add detail and drama to the sky with just one slider. Bellevue, WA, November 1, 2018 — Skylum Software today released a free update to its award-winning Luminar photo editor and presented the AI Sky Enhancer filter. Developed in the company’s AI Lab, AI Sky Enhancer adds depth, definition, and detail to any sky almost instantly, with only a swipe of a slider. 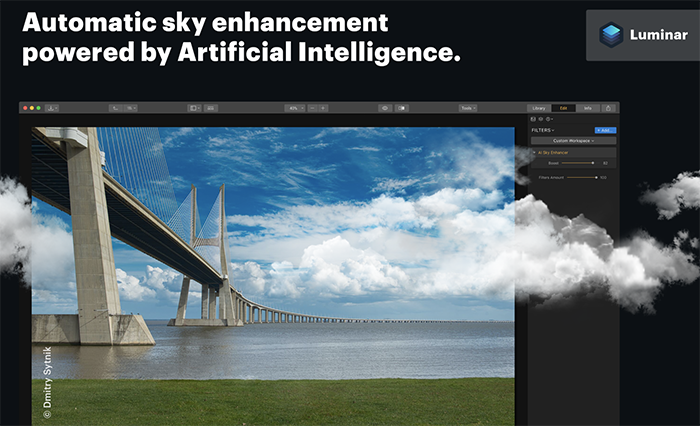 AI Sky Enhancer is a revolutionary new tool for automatically enhancing skies and making them beautiful without the need for masks and layers. This will save photographers an enormous amount of time in post-processing while allowing photographers of any skill level to achieve dramatic skies. Hundreds of thousands of photos incorporating varying degrees of tonal skies were used to train a deep neural network that powers the AI Sky Enhancer filter and allow Luminar to analyze each image and detect (and adjust) only the sky. The result is complete automated control of the sky. AI Sky Enhancer works with sunsets, blue skies, partly sunny skies, storm clouds, and virtually any other sky scene imaginable. The new AI-powered filter comes ahead of Luminar 3 with Libraries, which will start being rolled out to Luminar owners on December 18. Skylum has made the unprecedented decision to include every new feature of Luminar — big and small — at no additional cost to current Luminar 2018 owners until late 2019. This will include Luminar 3 with Libraries, which will allow photographers to organize, browse, and edit images on the fly. Additionally, Luminar customers don’t have to pay an annual subscription fee. New and current users of Luminar will also receive a value-added promotional package including a three-month Pro Membership to ViewBug ($42 value), a two-month Pro Membership to KelbyOne ($40 value), a choice of any ebook from Rocky Nook ($40 value), the Awesome Landscapes Tutorial from Daniel Kordan ($80 value), and a $20 gift card toward the purchase of any Manfrotto/Gitzo product valued at $120 or more. Luminar is available to new customers for just $59/€59/£53. Current users of other Skylum software including Aurora HDR, Photolemur, and Skylum legacy products can purchase Luminar for the special price of $49/€49/£44. 10% off (with $100 cap) on all eBay gear today only! The eBay super deal is back: Today only you save 15% (with max $100 discount) on all eBay US products and all eBay CA products including all camera/lens gear when using the coupon code “PICKUPTEN” at checkout! This Coupon is a 10% discount, valid from 8:00 AM ET on October 25, 2018 until 8:00 AM ET on October 26, 2018. No minimum purchase necessary. The Coupon discount is capped at a maximum value of $100. Discount applies to the purchase price (excluding shipping, handling, and taxes) of eligible items on eBay. ?com, cafr.ebay. ?ca and ebay.?ca. *Eligible items exclude warranties and protection plans, as well as items from the Coins & Paper Money, Gift Cards & Coupons, and Real Estate categories. Coupon must be used within a single transaction (and can include multiple eligible items), while supplies last. Max one redemption per user. Only eBay users registered on ebay. ?com, ebay. ?ca and cafr.ebay. ?ca, with an address located in the United States, Canada, Latin America or the Caribbean are eligible for the Coupon. Valid only for purchases from ebay. ?com, ebay. ?ca, and cafr.ebay.?ca. Any unused difference between the discount amount, as shown on the Coupon, and the purchase price of an item(s) in a single transaction (or cart) will be forfeited. Coupon is subject to U.S. laws, void where prohibited, not redeemable for cash, has no face value, and cannot be combined with any other Coupon, or when paying with PayPal Credit Easy Payments or Gift Cards. eBay may cancel, amend, or revoke the Coupon at any time including in response to fraudulent activity. 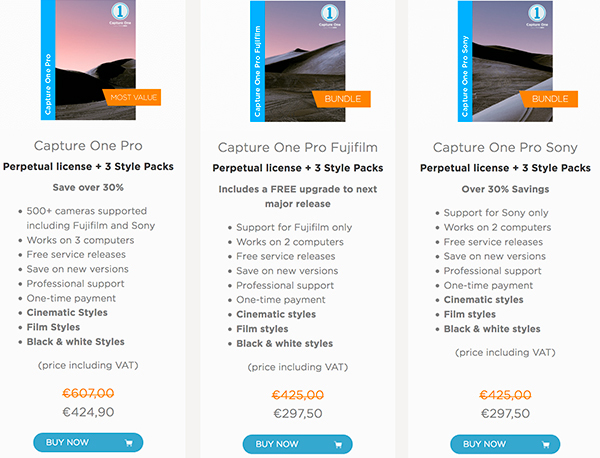 You save 30% on the Capture One Pro and 3 Styles pack (Click here). And you save additional 10% using our coupon code “AMBMR“. That makes a 40%+ saving! Skylum just launched the new AI powered Aurora HDR 2019 Pre-Order for MAC and Windows. The software will be releases on October 4 and you save $10 on it if you preorder it before that date! The eBay super deal is back: Today only you save 10% (with max $100 discount) on all eBay US products and all eBay CA products including all camera/lens gear when using the coupon code “PICKUPTEN” at checkout!